Professor in the Department of Family and Community Medicine at the University of Toronto in Ontario and Scientific Editor of Canadian Family Physician. Assistant Clinical Professor in the Department of Community Health Sciences at the University of Sherbrooke and Associate Researcher at the Charles-Le Moyne Hospital Research Centre in Sherbrooke, Que. Associate Vice Dean of Distributed Medical Education and the Academic Lead for the Physicianship Component at Outaouais Medical Campus in the Faculty of Medicine at McGill University. Professor in the Department of Family Medicine at the University of Alberta. To manage and mitigate potential harms for patients, family physicians must understand how adverse outcomes can occur and know the possible strategies that can reduce the potential for harms. Patients who experience adverse outcomes might experience regret, anger, or despair, while others might be unaware that they have experienced harm from screening. As part of an ongoing series of articles on screening from the Canadian Task Force on Preventive Health Care (CTFPHC), this article focuses on helping family physicians understand how harms can occur and supports the development of skills and strategies to mitigate them. We use examples mainly from cancer screening, but the issues apply to screening for most diseases. For each patient case, names and identifying details have been changed. Mr Brown, aged 71, was visiting his wife in the hospital. She was receiving palliative care for metastatic colorectal cancer that presented at an advanced stage 2 years previously. He underwent a screening colonoscopy shortly after she was diagnosed and was told he was “clear.” While at the hospital, he suddenly felt faint, had an overwhelming urge to have a bowel movement, and had an episode of bloody diarrhea. He was taken to the emergency department where investigations revealed a cancer of the hepatic flexure with direct invasion of the liver. After stabilization and discharge with plans for further follow-up and treatment, he returns to see you, very upset. Why did he get a late-stage cancer after he had an “all clear” on screening? What can you say? Mr Smith, a healthy and active 56-year-old man, comes in to see you for his periodic health assessment. He is at average risk of prostate cancer, but is influenced by a colleague at work who was recently diagnosed with the disease and by powerful messages from groups who advocate screening. After discussing CTFPHC recommendations for prostate cancer screening with the prostate- specific antigen test and using the tools provided,3 he decides to undergo screening. His test result is positive and you refer him to a urologist for further assessment. He undergoes a biopsy that does not find cancer. Unfortunately, 24 hours after the biopsy, he develops a serious infection and requires a 3-day admission to hospital. He returns to see you, regretful that he took the test. Mrs Jones is a 66-year-old retired nurse in good health. You last saw her 3 years ago for a periodic health assessment. At that time, she had a Papanicolaou test. Together you discussed screening mammography. In that discussion, you used the CTFPHC guidelines and patient educational materials,4 which demonstrate the benefits and harms of that screening. Weighing that information, she decided not to do the test. She returns to see you for another Pap test, but mentions she has a lump in her left breast. On examination, you confirm the finding that she has a 2-cm fixed mass in her breast and a palpable axillary lymph node. As you discuss the diagnostic possibilities, Mrs Jones becomes understandably upset and wonders whether she could have been diagnosed earlier if she had had a mammogram. You wonder how to handle this situation, and on reflection whether you would have advised her differently. How can screening for disease cause adverse outcomes? Table 1 shows what happens in the common situation of a diagnostic or screening test. Most people who are screened are grateful; if disease is detected, they are thankful that it was found, enabling treatment. We cannot know who among the diagnosed group benefited. Most assume they did, as do those found to have a false-positive result after investigation. 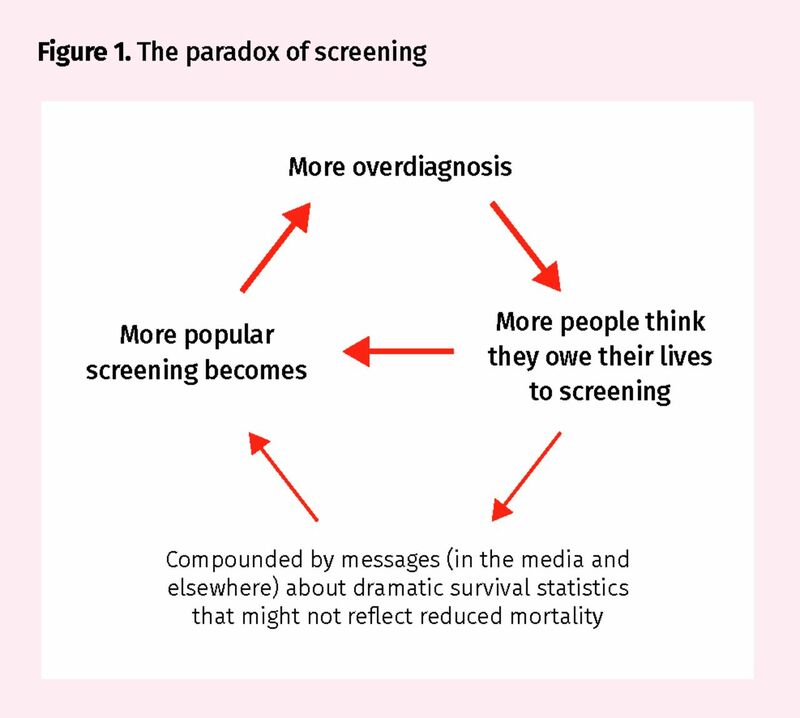 This has been called the popularity paradox of screening, as shown in Figure 1.5,6 People who have a negative result feel even better. To detect disease earlier in its course, a screening test is usually set with a threshold more sensitive than a diagnostic test, but it consequently often picks up changes that would never go on to cause trouble. This is demonstrated in Figure 2,6 illustrating the varied natural history of pathology that causes positive screening test results. “Fast” disease advances rapidly, so people might present clinically before screening tests can detect disease. Such disease is often rapidly fatal, so not helped by screening. Screening can detect “slow” disease early, so treatment can improve the outcome for at least a proportion of patients. 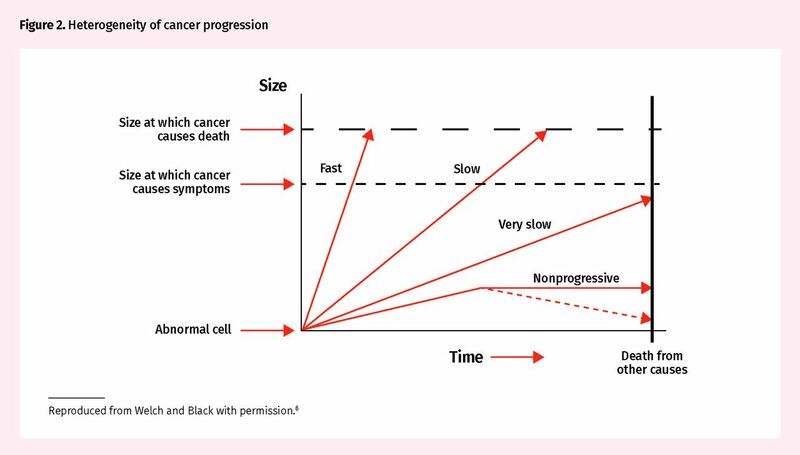 “Very slow” disease does not need to be detected, as it will not be fatal before some other disease kills the person. “Nonprogressive” disease has a different natural history and does not progress or might even regress, so never needed detection, much less treatment. While it might be surprising that some cancers regress, there is increasing evidence for this phenomenon. These concepts can be applied not only to cancer, but also to metabolic diseases, such as renal failure or diabetes, and cardiovascular disease. If disease is present, the favourable outcome is early detection for which treatment leads to the prolongation of life. This occurs rarely, as most diseases we screen for affect only a fraction of the population and few treatments are totally effective, so at least some patients detected by screening do not benefit from treatment. The proportion of false-positive laboratory and other test results is often several times greater than that of true-positive results.13 People with positive screening test results must be further investigated with more invasive or expensive testing before being reassured that they do not have disease. The process of waiting, then testing, is very stressful for many people. Many people with false-positive results are grateful that they have been investigated and found to be clear of disease. Again, consistent with the popularity paradox, they are relieved, even though some have been harmed psychologically. Some patients develop a heightened sense of vulnerability afterward.14,15 Some have been harmed physically as well. For example, open breast biopsy can leave painful scars, while colonoscopy can cause bowel perforation and other complications. Usually only a very small group of patients have negative test results despite harbouring disease. False-negative results occur because screening tests are imperfect, with sensitivity less than 100%, meaning they are unable to detect all disease present, especially early disease. These people are initially pleased the test result was negative. “Interval disease” that presents clinically between rounds of screening tests comprises both false negatives and some infrequent rapidly advancing disease that developed after the screening test and hence genuinely was not detectable at the time of screening. When the diagnosis occurs soon after a negative test result, it is more likely due to a false-negative result. For example, if in Mr Brown’s case, a large tumour were found within a month of the initial “normal” colonoscopy findings, that would most likely be a false negative; whereas, if it were a couple of years afterward, it could well have been interval disease. All physicians hope our patients fit in this group. Screening tests with high specificity leave a large proportion of people in this category. Most are reassured, but some who have had their anxiety raised enough to encourage them to have the test remain anxious. We have all had patients who are not reassured by negative screening test results and request the test be repeated before they are due again. Either way, they have had the cost and anxiety of screening to no benefit, when that effort could have been directed toward something more useful, so this is still a harm. Mr Brown had an interval cancer and he might have developed colorectal cancer after the colonoscopy. Alternatively, he might have had a false-negative result (ie, disease that was missed at his colonoscopy). There will always be a small error rate in endoscopy, which varies with operator skill and attention to detail.20,21 In an ideal world, family physicians would like to know the error rates for the specialists or teams we refer to, but those data are only analyzed and returned in a few Canadian centres. Most colonoscopists do not know their own error and complication rates or those of surrogate markers (adenomatous polyp detection rate, rates of colonoscopy completed to the cecum, average time taken to do the examination).22 Even when collected, these data are usually only made available to the providers doing the procedures, without consideration of possible benefits from sharing the information with the family physicians or patients. Patients have emotional responses of regret or even anger; physicians have such responses too. Mr Brown was very angry, asserting that something must have failed in the screening process. When he learned that a single colonoscopy screening reduces death from colon cancer by perhaps only 40% to 65%,23 he felt there was misrepresentation, as the information given to him implied that screening would prevent deaths due to colon cancers, without providing clear information that it has only partial effect. His wrath encompassed his family physician, as well as the rest of the “system” that he believed had failed him. Mr Smith was following the widespread messages about the value of prostate cancer screening, which seldom mention the potential for harm. He took the risk of being screened, perhaps swayed by emotion, and was diagnosed as not having cancer, but he sustained the serious harm of infection. This is a recognized complication of biopsy, occurring in at least 1% of men, and more recently 3.6%, with 1 in 1000 biopsied men dying as a result.24 Transperineal biopsies have a lower complication rate than transrectal biopsies do, so while MRI-guided prostate biopsies might have a greater probability of finding cancer, their complication rate appears to be related to the access route.24 By comparison, the optimistic estimate of living longer from prostate screening is around 1 per 1000 over 10 to 15 years,25 while the risk of overdiagnosis is estimated as 33 to 50 out of 1000 men screened after the same period,8 with many of these receiving overtreatment. This was discussed with Mr Smith. He was aware that he chose to be screened anyway and he regretted that decision, but was grateful that his family physician had at least taken the time to discuss his choices. Despite popular enthusiasm to screen,26 it is important to inform patients about the pros and cons of screening. Physicians and patients can then engage in shared decision making with consideration of patients’ values and preferences and decide whether to screen based on the balance of benefits and harms.27 Most people who make the choice not to screen will continue their lives and suffer no harms from the decision, as they would not get the disease.28 A small proportion will unfortunately develop the disease that the screening test detects. Both patients and physicians react emotionally to such events, and Mrs Jones’ situation is an example. When screening is not performed, some disease will still be treatable when it presents. Some will not. The question is whether the outcome is better for disease detected by screening; this might be true for a subset of patients, but not all. For example, while thyroid cancer incidence has escalated owing to early detection by ultrasound,29 it is not clear that concurrent small reductions in death rates are due to early detection or to better treatment of the few potentially fatal cancers. Mrs Jones made a probability decision about mammography screening based on the best information available. While she might regret this decision, we need to reassure her that it was reasonable in terms of the balance of uncommon benefit against the common harms.28,30 It is quite likely that most of the reduced mortality from breast cancer is due to better treatment in recent years. She can still benefit from that improved treatment. We need to be empathetic with Mrs Jones’ understandable emotion but not consider her original choice, nor our advice, to have been wrong. Many women make the same decision. Dr Fiona Godlee, the Editor in Chief of the BMJ, publicly stated at the Preventing Overdiagnosis conference (September 15, 2014) that she will not have a screening mammogram, believing that she is more likely to be harmed than helped by this test. Many physicians are anxious that not screening could lead to legal consequences. For situations where there is a justified body of opinion that screening is a choice, it is unlikely that such a case would succeed, especially if there is a record of the discussion. In a world of probabilities rather than certainties, it is most important that we describe the risk of making a decision that might be “right” but still have a bad outcome. Some physicians might be frightened by such “bad outcomes” and, thereafter, become screening “zealots” (insisting on all patients being screened). This has been termed the availability error—that is, recent or more vivid bad experiences impress us and colour our thinking while most go well and are barely noticed.31,32 This is the wrong reaction, as such practice will replace the harm of missed detection of disease with a large set of other harms, such as those brought about by false-positive test results and overdiagnosis. How can the family physician mitigate the harms associated with screening? Screening is generally performed in “low-risk populations,” but extending screening tests into populations with very low prevalence of disease has low possibility of benefit. Therefore, most positive results are false positives. Such populations include, for example, people below the recommended age for screening or those for whom the test is repeated at a shorter interval than recommended. In the extreme case, when there is no true disease in the population, all positive results are overdiagnosis or false positives. For the 5% of screening mammograms performed in Canada on women younger than age 5031 and for those getting annual breast or cervical screening or cervical screening before age 25, these are the most likely outcomes. As many of these people have concerns raised but investigation subsequently shows no disease, they are grateful to be given the “all clear”—again, the popularity paradox. In any judgment-based tests, such as pathology slide and x-ray scan readings or observing abnormalities in the mucosa of internal organs, there is variation in the ability to detect disease. Such variability is generally highest when trying to discriminate small changes in early disease. Therefore, reading screening results is difficult and quality needs to be regularly checked. It is hard for family physicians to assess the quality of specialists’ performance—still greater for screening tests. However, it is reasonable to ask what quality improvement processes they participate in and whether they perform to accepted standards. While we all would like more sensitive tests to detect every cancer, generally tests are more sensitive at the cost of lesser specificity, thus causing many more false positives with associated harm. Thus, we must be cautious about services that offer more sensitive tests, without informing both referring physicians and patients about the concomitant potential harms caused by false positives and overdiagnosis. Examples include new technologies for breast screening and human papillomavirus testing for cervical screening, and lowering the thresholds for diagnosing renal failure or essential hypertension. The promise of screening is that participation by patient and physician will save the person from a rare, but health- or life-threatening future outcome. However, like nearly all medical interventions, screening often causes harm. When the potential gain is large and frequent, as often happens in treatment situations, the balance of benefit favours the action. However, in screening healthy people, the benefit will improve outcomes for a very small proportion of the screened group on each occasion. For most programs, many more individuals who participate in screening are harmed. Sadly, few provincial and other screening programs provide information materials with specific numbers to inform physicians or participants. They prefer vague generalities that encourage screening without discussion of harms. The CTFPHC endeavours to provide balanced information (https://canadiantaskforce.ca). Screening provides choice about whether and how to change small probabilities, but cannot eliminate risk of the disease. Whatever decision is taken, there is always potential for an unwanted outcome. Patients and family physicians need to become more aware of this, be able to discuss it meaningfully, and develop strategies to cope with any bad outcomes. ▸ Regardless of how conscientiously or appropriately preventive screening is undertaken, it is inevitable that some patients will suffer harm owing to the heterogeneous nature of disease progression, the inherent limitations of screening tests, and unnecessary treatment. ▸ In screening for many conditions, adverse outcomes occur in large numbers of patients owing to frequent false positives and overdiagnosis. Adverse outcomes of screening can be emotionally and clinically challenging for both patients and physicians. Physicians need to be aware of the potential for adverse outcomes when making decisions with patients about screening. ▸ Strategies to mitigate the harms of screening include shared decision making with patients, supported by knowledge translation tools that describe the balance between benefits and harms. ▸ A decision not to screen is rarely followed by the detection of disease. When it is, this adverse outcome is more emotionally and clinically challenging for patients and physicians than a screening decision that resulted in unnecessary tests or treatments. ▸ Legal medical concerns surrounding adverse outcomes of screening or not screening are mitigated by shared decision making between physicians and patients that includes discussion of the harms and benefits associated with screening decisions. Physicians should document these discussions. La traduction en français de cet article se trouve à www.cfp.ca dans la table des matières du numéro de juillet 2018 à la page e299. Canadian Task Force on Preventive Health. Tools & resources. Prostate cancer. Calgary, AB: Canadian Task Force on Preventive Health; Available from: https://canadiantaskforce.ca/prostate-cancer-tools. Accessed 2018 Apr 29. Tools & resources. Breast cancer. Calgary, AB: Canadian Task Force on Preventive Health; Available from: https://canadiantaskforce.ca/tools-resources/breast-cancer-2. Accessed 2018 Apr 29.
. Screening. Evidence and practice. New York, NY: Oxford University Press; 2007.
. The challenge of communicating overdiagnosis. Presented at: Preventing Overdiagnosis; 2015 Sep 1–3; Bethesda, MD. Available from: www.preventingoverdiagnosis.net/?page_id=1089. Accessed 2018 Apr 16.
. Evidence synthesis number 154. Prostate-specific antigen-based screening for prostate cancer: a systematic evidence review for the U.S. Preventive Services Task Force. Rockville, MD: Agency for Healthcare Research and Quality, US Department of Health and Human Services; 2017.
. Prostate-cancer mortality at 11 years of follow-up. N Engl J Med 2012;366(11):981-90. Erratum in: N Engl J Med 2012;366(22):2137.
. Screening and prostate cancer mortality: results of the European Randomised Study of Screening for Prostate Cancer (ERSPC) at 13 years of follow-up. Lancet 2014;384(9959):2027-35.
. Cancer screening: the clash of science and intuition. Annu Rev Med 2009;60:125-37.
. Reconsidering the criteria for evaluating proposed screening programs: reflections from 4 current and former members of the U.S. Preventive Services Task Force. Epidemiol Rev 2011;33(1):20-35. Epub 2011 Jun 10.
. More than half of abnormal results from laboratory tests ordered by family physicians could be false-positive. Can Fam Physician 2018;64:202-3.
. Psychological costs of screening. BMJ 1989;299(6698):527.
. Quantification of harms in cancer screening trails: literature review. BMJ 2013;347. f5334.
. Presentation of benefits and harms in US cancer screening and prevention guidelines: systematic review. J Natl Cancer Inst 2016;108(6). djv436.
. Clinicians’ expectations of the benefits and harms of treatments, screening, and tests: a systematic review. JAMA Intern Med 2017;177(3):407-19.
. The association of colonoscopy quality indicators with the detection of screen-relevant lesions, adverse events, and postcolonoscopy cancers in an asymptomatic Canadian colorectal cancer screening population. Gastrointest Endosc 2015;82(5):887-94. Epub 2015 May 5.
. Practice and documentation of performance of colonoscopy in a central Canadian health region. Can J Gastroenterol Hepatol 2014;28(4):185-90.
. Audit and feedback interventions to improve endoscopist performance: principles and effectiveness. Best Pract Res Clin Gastroenterol 2016;30(3):473-85. Epub 2016 Apr 16.
. Estimation of benefits, burden, and harms of colorectal cancer screening strategies: modeling study for the US Preventive Services Task Force. JAMA 2016;315(23):2595-609.
. Complications after systematic, random, and image-guided prostate biopsy. Eur Urol 2017;71(3):353-65. Epub 2016 Aug 17.
. Cancer screening campaigns—getting past uninformative persuasion. N Engl J Med 2012;367(18):1677-9.
. Lazris & Rifkin’s risk-benefit characterization theater [video]. Menlo Park, CA: Kaiser Health News; 2016. Available from: www.youtube.com/watch?v=UZlY6Q4m-MM&feature=youtu.be. Accessed 2018 Apr 29.
. The importance of cognitive errors in diagnosis and strategies to minimize them. Acad Med 2003;78(8):775-80.
. The power of regret. N Engl J Med 2017;377(16):1507-9.
. What are natural frequencies? BMJ 2011;343. d6386. Tools & resources. Prostate cancer—1000-person tool. Calgary, AB: Canadian Task Force on Preventive Health Care; 2018. Available from: https://canadiantaskforce.ca/tools-resources/prostate-cancer-harms-and-benefits. Accessed 2018 Apr 29. Harding Center for Risk Literacy. Fact boxes. Berlin, Germany: Harding Center for Risk Literacy; Available from: www.harding-center.mpg.de/en/fact-boxes. Accessed 2018 Apr 29.
. Draft recommendation statement. Osteoporosis to prevent fractures: screening. Rockville, MD: US Preventive Services Task Force; 2017. Available from: www.uspreventiveservicestaskforce.org/Page/Document/draft-recommendation-statement/osteoporosis-screening1. Accessed 2018 Apr 29.
. Is the false-positive rate in mammography in North America too high? Br J Radiol 2016;89(1065):20160045. Epub 2016 Jun 8. Breast cancer screening in Canada. Monitoring & evaluation of quality indicators. Results report, January 2011 to December 2012. Toronto, ON: Canadian Partnership Against Cancer; 2017. Available from: https://content.cancerview.ca/download/cv/prevention_and_screening/screening_and_early_diagnosis/documents/breast_cancer_screening_canada_monitoring_evaluating_report_2011_12p?attachment=0. Accessed 2018 Apr 16.
. Can you un-ring the bell? A qualitative study of how affect influences cancer screening decisions. BMC Cancer 2017;17(1):647.